If having a vinyl privacy fence installed has been sitting on your to-do list, then now is the time to call on the professionals at Chesley Fence & Deck. Since 1967, we have been the leading fence installer in the Columbia, Illinois area. We offer first-class products, installations, and service that other companies simply cannot match, which is why we have installed more fencing than anyone else in our territory. Let our knowledgeable employees help you select the privacy fence of your dreams, and you will quickly see the Chesley Fence & Deck difference. A privacy fence can do wonders for your yard in Columbia, IL. Not only can it keep your pets and children safe and secure in the yard, as well as increase the security of your yard, but it will also improve your yard’s appearance and possibly increase your home’s value. And, when you adorn your yard with a vinyl privacy fence from Chesley Fence & Deck, you surely won’t be disappointed with the quality. We offer American-made, vinyl fencing crafted by industry leader CertainTeed that will certainly impress any guest or passerby. Plus, it is made to be more durable than comparable products to withstand the forces of nature, and its poles are set 44 inches deep for increased durability. Plus, this fencing option is resistant to fading and discoloration, so that it looks like new for longer. What’s more, it’s low-maintenance, requiring just a simple wipe down with soap and water. It’s easy to see that there is a lot to love about our vinyl fencing. Yet, the benefits don’t stop there. When you partner with Chesley Fence & Deck for a vinyl privacy fence, you will also receive an installation that is worthy of our world-class fencing. We will use our own factory-trained and experienced technicians, never subcontractors, to install your fencing to ensure that the job is completed flawlessly. Plus, we will place your fencing in any configuration you desire to meet your lifestyle needs. 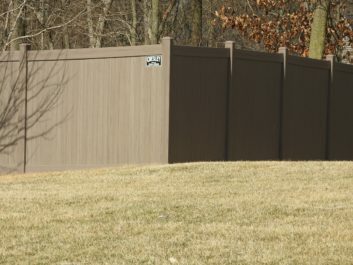 Contact Chesley Fence & Deck today to have a vinyl privacy fence installed in your yard in Columbia, IL. And, be sure to ask about the lifetime warranties we offer with all our vinyl products.